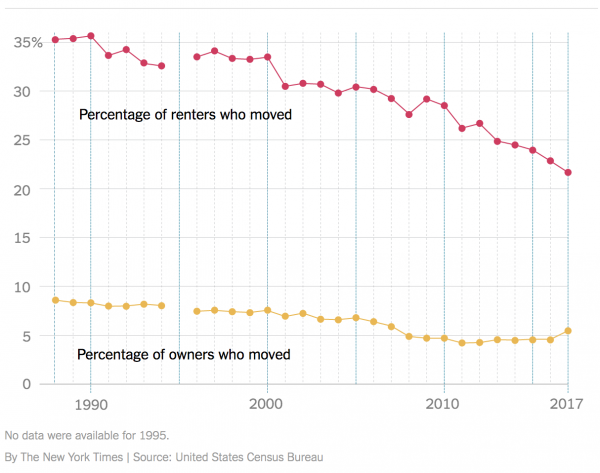 This is how the housing market story should be told (there is no sound). The president signed the tax bill into law today – it has been a primary driver of national news for most of the fall. It reverses nearly a full century of the favored status of the asset class by removing deductions that are long baked into housing values and buying decisions. The whole home buying process will be rethought going forward. Generally speaking, the impact will be much more severe on the east and west coasts than it will in the middle of the country because housing prices are much higher. I covered the pros and cons of the tax bill in my 12/14/17 white paper last week: House & Senate Tax Bills: Issues Related to Housing. President Trump pushed for law’s title to be the “Cut Cut Cut Act” as a branding mechanism but the name didn’t stick. Because the tax bill was not publicly vetted and on adoption, few congressional members had actually read it, the implications are not yet fully understood so I expect more issues relating to housing will be discovered in the coming months. If there is one thing the housing market doesn’t like, it is uncertainty. As it relates to housing, this new law is an “uncertainty casserole” and homebuyers and sellers will take a while, probably 1-2 years to adapt to the new world order and sales will be tempered until there is equilibrium. Prices in high-cost housing markets will clearly slip, although I don’t anticipate a severity. 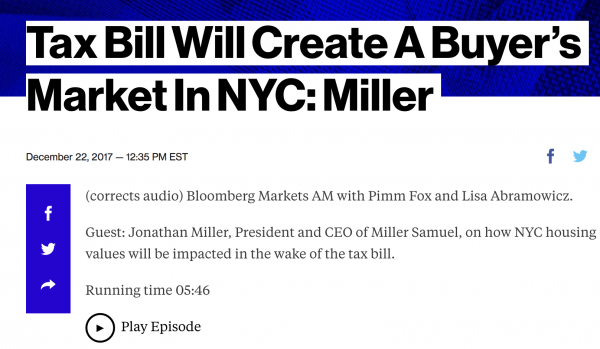 Here’s my interview on Bloomberg Radio concerning the new tax law’s impact on high-cost housing markets like NYC. I joined Pimm Fox on Bloomberg Radio this morning on Bloomberg Markets AM. It was prompted by Oshrat Carmiel’s article: Tax Overhaul May Mean Lower Prices for Manhattan Homebuyers. One of the implications of the new tax law is the restriction on mobility for homeowners in high-cost markets who have to decide whether to give up their existing MID and bear more expenses on their home purchase. I suspect this will be more pronounced over the next 1-2 years as buyers and sellers get in sync with the ramifications of the new tax law. This has already been the story in the rental market nationwide. Here’s a fun article from the new Quartz site called “Quartzy” that proclaims THERE’S NEVER BEEN A BETTER TIME TO BUY A $50 MILLION NYC DREAM PAD. 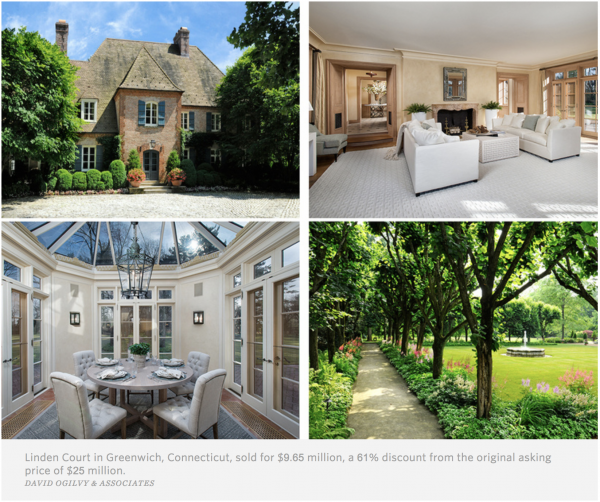 Greenwich, CT 12,386 SqFt Mansion Dropped 61% from $25,000,000 2013 ask to a $9,650,000 sales price. 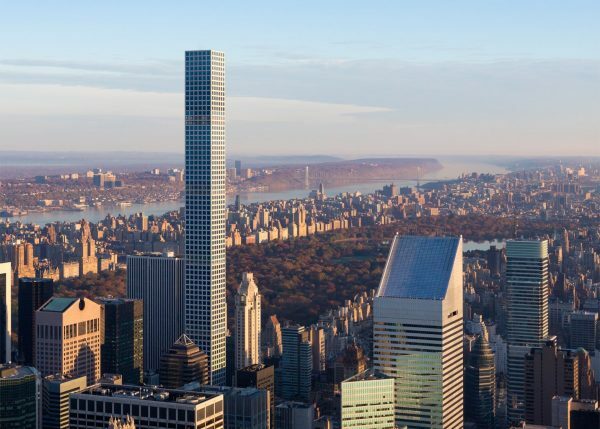 New York, NY 11,906 SqFt Condo Dropped 24% from $120,000,000 2013 ask to the $91,125,497 sales price. Oh, and the buyer still has to combine and renovate the 3 units into one unit. As a reader of Housing Notes, you know that I refer to 2014 as “Peak Luxury” and I was largely referring to U.S. urban markets. However, in 2014, we began to see luxury condo development in suburban markets as the urban markets heated up. The luxury product seemed targeted at high-end housing empty-nesters who were downsizing or urban trade-up buyers who were priced out. While these luxury condos were significantly more expensive than existing condo housing stock, urban buyers were already conditioned to multi-family living and existing luxury single-family homeowners didn’t have to worry about mowing the lawn or painting the house. 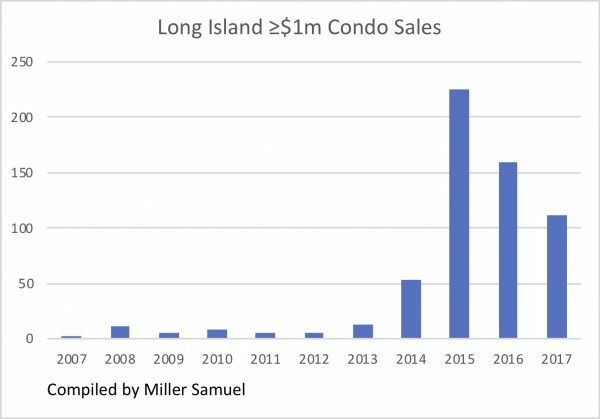 There’s a good read in Newsday today on this phenomenon occurring in Long Island: Super deluxe condominiums are on the rise on Long Island. This includes all of Nassau and Suffolk counties (ie includes Hamptons/North Fork out east). The following chart clearly shows the 2015 spike, but the contract groundswell began in 2014 and closed in 2015. The 2017 sales volume, while off the pace of 2015, is substantially above prior peak levels. My dear Appraiserville readers. If you can do one important thing for your appraisal profession, this is your opportunity and it doesn’t cost you anything but a few minutes of your time (and at AMC appraiser rates, it’s virtually free). Please provide feedback immediately to “two banking institutions have requested that the Appraisal Subcommittee temporarily waive the requirement for use of state licensed or certified appraisers” based on the fake claim of an appraisal shortage. I wrote about Tristar Bank in Appraiserville a few weeks ago. It is worth re-visiting since I translate the Tristar request into my interpretation of what they are really saying. It is recommended to send your responses ASAP to webmaster@asc.gov rather than to Jim Park directly although either way is fine. The Appraisal Foundation intends to provide comment and will provide you with a copy of our letter. Thank you for your attention to this critical matter. Please take a few minutes and respond to this critical issue. The Virginia Coalition of Appraisers (VaCAP) shares a Solidifi (an AMC) email blast to its appraiser panel and the subsequent response by the appraiser (not from Virginia). The following AMC letter is tone deaf and Grinch-Like, showing how Solidifi feels about their valuation professionals (bold emphasis mine). 1. If you have an order due on Christmas eve, Christmas or the day after, please make plans to meet the due date or turn reports in early. Turning reports in late due to a holiday is NOT ACCEPTABLE. Every effort should be made to set the right delivery expectations. 2. IF there are revisions on your file, please try your best to be available to address revisions on a rush if possible. Obviously, I don’t expect you to take time away from your families, but I still do expect an ETA from you, as we are paying you for a product and expect the product to be delivered in a timely fashion. 3. UPDATE. UPDATE. UPDATE. Please make sure orders are notated properly, especially if there is borrower delay. I have been reaching out to borrowers on files who have confirmed they have been able to meet sooner than the appraiser has in the system. Please note, I can and will check with borrowers, so please ensure notes are kept. 4. Lastly, please double check lender requirements on orders, and please note that ALL COMP PHOTOS ARE TO BE ORIGINAL ON ALMOST EVERY ORDER. If there is a comparable that cannot have a photo taken for whatever reason, take the best photo possible (i.e. road closed sign, construction) and include an MLS photo with commentary outlining why the photo could not be taken. That grade school closing sentence is especially insulting to any professional that works for them. It clearly demonstrates that Solodifi bombards their appraisers with such a high volume of CYA emails for policy statements and status checks that the appraisers can’t possibly keep up. So to test how many appraisers read their email, they inserted a silly question into it. Here is how the appraiser responded to this email. If this offends you as much as it did the appraisers who received this e-mail you might want to consider getting away from the AMC model and going with a portal such as Appraisalport, Mercury Network or AppraisalScope as appraisers would much rather work in the portal environment rather than for the AMC model that has continued to disrespect the professional appraiser. And if you’re an Appraiser but NOT a Monty Python fan (seems impossible), then this should serve as a useful analogy too. And I’ll name my favorite Christmas song (White Christmas – Bing Crosby version).